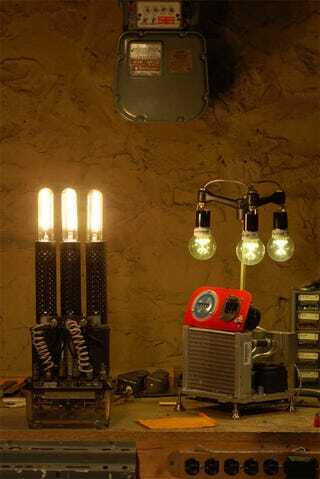 These two beautifully quirky lamps were fashioned out of obsolete technology, including aircraft compasses, railroad signal switching relays and stainless-steel ink cylinders. Creative recycling is so awesome. The lamps were made by Alan Lishness over at the Gulf of Maine Research Institute. The round bulbed one was made from a water-cooled dual processor yanked from an Apple G5 desktop, an hour meter, an aircraft compass and 40W LED bulbs.